Automobili Lamborghini is taking a major step into the future: with the newly developed Huracán LP 610-4, the successor to the highly successful Gallardo, the Italian super sports car manufacturer is redefining the benchmark in the segment. With 14,022 units produced, the Gallardo is the most successful Lamborghini model ever made. During its ten-year production run, it took the brand into a completely new dimension. In true Lamborghini tradition, 3 the successor to the Gallardo also takes its name from the world of bullfighting: Huracán was a fighting bull of the Spanish Conte de la Patilla breed who fought in August 1879 in Alicante. His unyielding character made him invincible. With the Huracán LP 610-4, Lamborghini is taking its purist, unmistakable design language to a whole new evolutionary level. The design is bold and edgy, with beautifully sculptural forms. The starting point of the design process was the Huracán’s silhouette. The objective was to define the car with a single line stretching from the front end over the passenger cell to the rear. The side windows take on a hexagonal form that looks like a gem set into the profile of the Huracán. At night, too, it is utterly unmistakable: All lights, including the main headlamps, beam in LED technology – an absolute first in the super sports car segment. An innovative cockpit dominates the interior. The 12.3-inch TFT display can be configured in a number of different modes and provides the driver with all key information in a virtual format. The slender lines of the instrument mounts and the center tunnel are indicative of the lightness of the interior design. Fine materials distinguish the interior, which can be extensively individualized, while the extremely detailed craftsmanship delivers a highly refined sense of quality. The newly conceived hybrid chassis of the Huracán LP 610-4 is a technical work of art that unites carbon-fiber and aluminum components. The ultralight chassis forms the basis for the vehicle’s low dry weight of 1,422 kilograms; with its excellent stiffness, it guarantees the handling precision of a racing car. 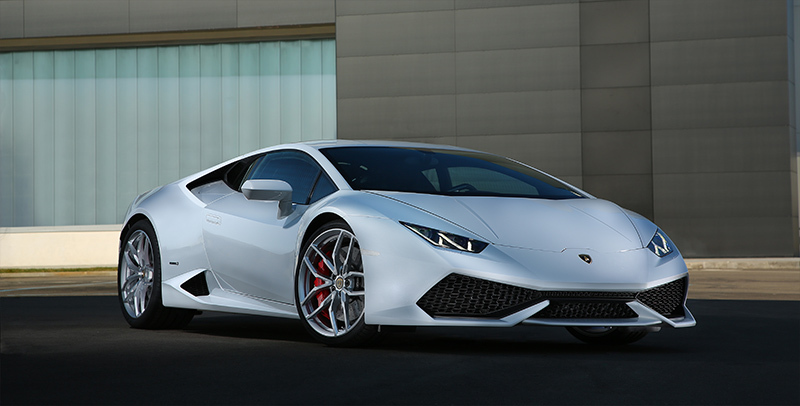 The new V10 engine in the Huracán generates its phenomenal propulsion from a displacement of 5.2 liters. It produces a power output of 448 kW / 610 hp at 8,250 rpm and a maximum torque of 560 Nm at 6,500 rpm. The new “Iniezione Diretta Stratificata” combines direct and indirect injection – 4 achieving an increase in power and torque compared with the Gallardo and a decrease in fuel consumption and emissions. With its power-to-weight ratio of just 2.33 kilograms per hp, the Lamborghini Huracán achieves absolutely breathtaking performance. The top speed of more than 325 km/h and the acceleration figures – zero to 100 km/h in 3.2 seconds, zero to 200 km/h in 9.9 seconds – offer an indication of its dynamics. Thanks in part to the Stop & Start technology, ECE average fuel consumption has dropped to 12.5 liters per 100 km (290 g CO2 per km). The power generated by the ten-cylinder is delivered to the road via the new 7-speed dual-clutch transmission “Lamborghini Doppia Frizione” (LDF) and an all-wheel drive that also features a new hydraulic multi-plate clutch. Three different driving modes, spanning from road to race track, can be selected using a drive select switch in the steering wheel. The system is called ANIMA (Italian for Soul) – “Adaptive Network Intelligent Management”, and impacts the engine, the transmission, the all-wheel drive and the ESC handling system as well as other dynamic systems. The wheels of the Lamborghini Huracán measure 20 inches in diameter, with the standard-fit carbon-ceramic brake system delivering exceptional stopping power. As an option, Lamborghini offers its new luxury super sports car with the Lamborghini Dynamic Steering variable steering system and MagneRide electromagnetic damper control. Both of these features are also integrated into ANIMA. The Lamborghini Huracán LP 610-4 celebrates its show premiere at the 2014 Geneva Motor Show, with customer delivery scheduled to start in spring 2014. The Huracán is priced at 169,500.00 Euro, excluding taxes. The Production takes place at Automobili Lamborghini headquarters in Sant’Agata Bolognese. The elegance of a Lamborghini is in the beauty of its highly concentrated power – every line and every detail pursues the need for speed, dynamics, performance. Design is an essential element of the Huracán LP 610-4, too – unmistakable, hermetically sealed and completely free from ornamentation. The dimensions frame the contours of a dynamic wedge measuring 4,459 mm long, 1,924 mm wide and 1,165 mm high, with a wheelbase of 2,620 mm. Taut curves contrast with sharp edges, which require innovative technology in working with aluminum and carbon fiber and with geometric surfaces. A characteristic basic form for Lamborghini is the hexagon – visible in the front air intakes and their three-dimensionally formed mesh inserts, in the side windows, in the intake openings for the engine and in the standard-fit wheels in Giano design. The arrow-shaped front end of the Lamborghini Huracán angles sharply downward like the nose of a shark, with two pleats adding contour to the hood. The flat, angular headlamps are fitted only with LEDs – an innovation in this class of super sports car. Light guides produce the daytime running light, forming two Y-shaped contours in each headlamp and giving the Huracán the look of a predator ready to pounce. With a color temperature of 5,500 Kelvin, the LED light is very close to that of daylight, providing excellent road illumination and putting very little stress on the eyes. The LEDs are designed to last the lifetime of the vehicle and are extremely energy efficient. A massive air intake, cut deep into the front end and stretching across its full width, dominates the front of the Huracán. Fins painted in body color cut strong diagonal lines through it. As on a race car, the lower contours of the air intake jut forward to form a splitter. The avant-garde character of the Lamborghini design is particularly evident from the side – the Huracán LP 610-4 is a fast-moving technical sculpture. 6 Its aluminum cladding stretches tautly over the mighty 20-inch wheels; a single, flowing line runs from the front end over the roof to the rear. The roof arcs slightly over the heads of the driver and co-driver, these contours continuing onto the luggage compartment lid and through the extremely low-lying C-pillars. Starting at the headlamp, is a line that runs over the front fender to define a broad, angled edge on the door. Together with the flat, dropping roof arc, the rising door edge presents a three-dimensional frame for the side windows – which are set into the flanks like gemstones. Where these lines meet at an acute angle is the upper intake that feeds the engine with air. The lower intake for cooling air emerges from the angular sill in front of the wide, rear wheel arch. The absence of the large, vertical air intake that was a feature of the Gallardo, brings athletic tension and powerful flow to the flank of the Huracán. In its standard format, the engine cover between the extremely low-lying Cpillars consists of three large, matte-black polymer fins in homage to the classic Miura. Lamborghini offers an optional transparent cover that reveals a clear view of the V10. In this version, the engine bay is clad in visible carbon fiber, made using Lamborghini’s patented Forged Composite Technology. 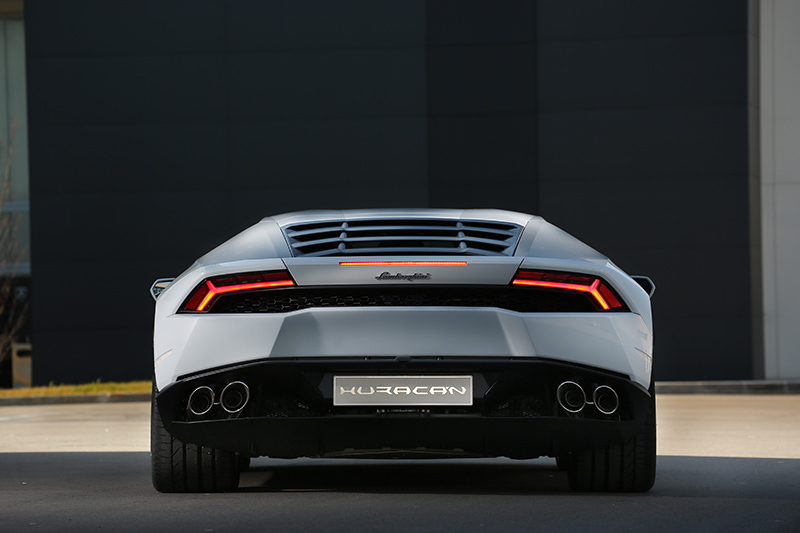 The rear end of the Huracán also has a highly three-dimensional form. Like the intake at the front end, the wide, meshed outlet for ventilating the engine bay is cut deep into the rear. Above it are the narrow rear lights, likewise fitted entirely with LEDs. Similar to the front headlamps, their light also takes on a Y-shaped contour. The four end pipes of the exhaust system flank a large diffuser; its substantially dimensioned elliptical fairings are chromed and perforated. Each design detail of the Lamborghini Huracán LP 610-4 celebrates the aesthetic of function; the designers from the Centro Stile worked closely 7 together with the aerodynamic experts. The large air intakes at the front of the super sports car specifically direct the cooling air and headwind to increase down pressure on the front axle. The spoiler lip at the rear works together with the rising diffuser in the underbody to improve airflow around the rear of the car – the Huracán does not require a movable rear spoiler. The underbody is completely clad, with NACA channels directing headwind to the radiators. Lamborghini offers the Huracán in 17 colors, including seven new ones. The flat colors are Bianco Monocerus and Nero Noctis. The metallic tones come with the names Bianco Icarus, Blu Achelous, Grigio Lynx, Grigio Nimbus, Nero Serapis and Rosso Mars. The pearlescent shades are Arancio Borealis, Giallo Midas and Verde Mantis. Also available from the Ad Personam individualization program are the matte paint finishes Bianco Canopus, Giallo Horus, Grigio Titans, Marrone Apus and Nero Nemesis. The metallic colors from Ad Personam – Blu Caelum, Grigio Admetus and Marrone Alcestis – complete the color palette. Lamborghini rises to the next level with the Huracán LP 610-4 when it comes to the bodyshell concept, too. The Gallardo had an aluminum space frame – an extremely stiff framework consisting of cast nodes and extruded profile with permanently integrated aluminum panels. Its successor features an innovative hybrid chassis. It combines aluminum components with large elements made from carbon-fiber reinforced polymer (CFRP) – that ultra-lightweight material in which Lamborghini has developed groundbreaking expertise over many years. The hybrid chassis of the Lamborghini Huracán consists partly of aluminum; the front and rear sections of the car with the axle mounts are made almost entirely from the lightweight alloy, and carbon-fiber parts produced using the RTM process (Resin Transfer Molding). They are 8 concentrated around the occupant cell, where they form part of the floor and sills, the center tunnel, the rear bulkhead and the B-pillars with their particularly complicated geometries. The x-shaped brace in the engine bay is also made from CFRP. Stainless steel fasteners connect the aluminum and carbon-fiber components. The innovative hybrid chassis of the Lamborghini Huracán LP 610-4 weighs less than 200 kilograms, even less than the already very lightweight space frame of the Gallardo. The hybrid chassis is considerably better when it comes to crash safety and stiffness, which lays the foundation for the dynamic handling and precise production finish. The rear bulkhead, for instance, offers excellent protection in the event of a side impact, because its fibers are laid out in exactly the direction of load travel. The state-of-the-art interior of the Lamborghini Huracán LP 610-4 offers wonderful consistency in its design, a thrillingly sporty character and relaxing comfort for long-distance driving. The distinctive feature of the exterior design – the sharply defined hexagonal body and surfaces – plays a dominant role here, too. The dashboard is low-slung and features hexagonal trim elements on its extremely slender fascia. The instrument display and air vents look like standalone, add-on components. A console stretches from the dashboard to the center tunnel. Inside the Huracán, the driver and co-driver enjoy more space and better visibility than in the Lamborghini Gallardo – both are just as evident on a trip to the race track as they are on the daily drive into work. The low seats with their pronounced contouring and integrated backrests provide the body with excellent grip and support. In the standard version, they can be electrically adjusted for the angle of the backrest and longitudinal position. Further electrical functions for seat height, seat angle and the length of the seat cushion are available as options. The operating concept for the Lamborghini Huracán LP 610-4 is strictly focused on the driver. He/she can use the buttons on the flat-bottomed three-spoke steering wheel to manage the many vehicle functions, including indicators and windshield wipers; the two large shift paddles serve to control the dual-clutch gearbox. In executing all actions, the driver can keep eyes on the road and hands on the steering wheel at all times. Behind the steering wheel is a 12.3-inch TFT screen with a high resolution of 1440 x 540 pixels. The virtual cockpit presents all critical information in razor-sharp 3D graphics with sophisticated visual effects. Working in the background is a super-fast graphic processor, the Tegra 30 chip from the Tegra 3 Series by Nvidia. For the rev counter, for instance, it generates 60 frames per second, ensuring absolutely homogenous movement of the needle. The driver can switch between three display screens. In Full drive mode, the large, central rev counter dominates the view, flanked by displays for fuel level and water temperature. Speed is shown as a digital read-out. In Mixed mode, the rev counter is smaller and moves to the left, with a window for infotainment functions like the navigation map occupying the right half of the display. In Full Navi and Infotainment mode, the map fills most of the monitor. Regardless of the mode selected, the display along the lower edge shows all the important warning and advisory symbols. There are further display and control elements on the long center console, ergonomically arranged as if on a lectern. The uppermost one is a narrow TFT display for the climate control, which can be switched to show oil pressure, oil temperature and voltage. Beneath it is a strip of switches for secondary functions, accompanied by another group of switches on the left of the cockpit. In the center of the console are the controls for the automatic air conditioning and the infotainment system. Its main control is surrounded by 10 buttons that provide direct access to the main menus of the navigation, phone, info, radio, media and sound functions; a further rotary control is for volume adjustment. Arranged horizontally on the center tunnel are the start/stop button beneath a red flap, the transmission buttons for neutral, park and reverse gear and the button for the electronic parking brake. Two glove boxes, a cell-phone tray and two door pockets accommodate the small things of everyday life. The uncompromising precision and attention to detail with which the interior of the Lamborghini Huracán LP 610-4 is crafted, is rooted in the finest tradition of Italian craftsmanship and sets new benchmarks in the league of super sports cars. Luxury materials indulge the senses with their fine look and feel; their selection and the choice of colors on offer are clear evidence of the fine touch and keen eye of the Lamborghini designers. The upper area of the dashboard is clad in dark Alcantara to avoid reflections in the windshield. LEDs provide the interior illumination, too – there is not as single conventional bulb anywhere on or in the car. One color dominates the interior of the Huracán – Nero Ade black. The dashboard, center console, the center panels on the seats and the door panels are all clad as standard in soft leather, with Alcantara setting accents on the air vents and on the inside of the door mirrors. To complement this, customers can choose from four interior variants. They can use these in a number of ways – depending on the variant – to individualize the lower zone of the dashboard, the center console, door grips, door mirrors, the center panels of the seat backs, the air vents and the cladding on the A-pillars and roof beams. The Elegante two-tone interior comes with a choice of nine contrasting colors and additional leather options; the upper part of the center console gleams in high-gloss black, with the air vents painted in matte dark gray. In the one-tone Sportivo interior, much of the cladding is made from Alcantara in Nero Ade, while the two-tone Sportivo interior offers 11 Alcantara in six contrasting colors. Alternatively, the two-tone Sportivo interior also comes with supple nappa leather. As an option, the stitching – a total of 30 meters – is also available in a contrasting color. The program is rounded off by further options such as Lamborghini logos and lettering for the interior, or foot mats with leather piping. The acronym LP in the model name of the Huracán LP 610-4 refers to the orientation of the extensively redesigned V10 engine – it is mounted in typical Lamborghini fashion longitudinally behind the driver (“longitudinale posteriore”). The number 610 is the power output in hp, which equates to 449 kW and is available at 8,250 rpm. The specific output is no less than 86.3 kW / 117.3 hp per liter of displacement; the torque curve reaches its peak of 560 Nm at 6,500 revs. Like every Lamborghini engine, the 5.2-liter V10 is a high-performance, naturally aspirated unit. It captivates the driver’s senses with stunning throttle response, with gloriously free revving well over the 8,000 mark, with amazing pulling power and with an inimitable sound that takes on new facets as the revs rise – founded on a voluminous bass and topped by soaring trebles. The ten-cylinder catapults the Huracán LP 610-4 from a standstill to 100 km/h in just 3.2 seconds – each hp has to move a mere 2.33 kilograms. The figure from zero to 200 km/h is 9.9 seconds, while the top speed is on the other side of 325 km/h. Yet, the high-performance engine makes do with an average of 12.5 liters of fuel per 100 km, a CO2 equivalent of 290 grams per km. The improvement versus the Gallardo LP 560-4, aided also by a Stop & Start system as standard, is 11 percent. The displacement of 5,204 cm3 is the result of an 84.5 millimeter bore and 92.8 millimeter stroke. The V10 fires alternately at 54 and 90 degrees, with 12 its forged crankshaft conceived as a common-pin shaft. This construction, in which the conrods of the opposing pistons run on a common crank pin, maximizes stiffness while minimizing weight. The forged-steel conrods and the forged aluminum pistons are likewise both extremely strong and lightweight. The crankcase is made from an aluminum-silicon alloy and is produced using a low-pressure gravity die-casting process that guarantees a particularly high level of homogeneity. The high silicon content makes the cylinder barrels extremely wear resistant. A bedplate construction gives the crankcase exceptional stiffness and optimum vibration characteristics. The cast-iron bearing bridges reduce thermal expansion and thus minimize play in the crankshaft main bearings. The dry sump lubrication with its separate oil tank is a classic motorsport technology. It allows the V10 to sit very low down, while assuring it receives an adequate supply of lubricant, even under extreme lateral acceleration. The pressure-lubrication pump works in accordance with load, making it highly efficient. The ten cylinders are always very well filled. Four camshafts, each of which can be adjusted through 42 degrees of crank angle, actuate the valves via roller cam followers. Like the oil pump and the water pump, they are driven by chains running at the back of the engine. The plenum chamber of the two-channel intake system is made from lightweight polymer; in the intake channels are pneumatic flaps. When the load and revs are low, they set the incoming air into a cylindrical rotation; this tumble further increases the efficiency of the combustion process. The exhaust system is also conceived with two channels, with its components laid out for low back pressure. There are flaps in the two end pipes; the vacuum formed at higher loads and revs causes them to open, giving a fuller, deeper sound. One groundbreaking innovation of the V10 is the dual fuel injection, known as “Iniezione Diretta Stratificata”. On start-up and under higher loads and revs, a common-rail system injects fuel at a pressure of up to 180 bar directly into the combustion chambers. This results in intense swirl, which has the effect of cooling the cylinder walls and permits a higher compression ratio of 12.7:1. At lower loads, fuel is injected indirectly into the manifold, which reduces fuel consumption and particulate emissions. At medium loads and revs, both injection systems work together. The V10 already complies with the EU6 norm. Superfast, virtually imperceptible gearshifts without any interruption in torque – the Lamborghini Huracán LP 610-4 comes with a completely new transmission. Where the Gallardo still used the e.gear automated manual transmission, its successor features the Lamborghini Doppia Frizione (LDF) 7-speed dual-clutch gearbox. It is exceptionally efficient and its ratios are closely set for maximum sporting performance. The LDF transmission, mounted behind the V10 at the rear of the Huracán, is extremely compact at less than 60 centimeters long. Its control and actuation is via a separate block, where the electronic, mechanical and hydraulic components all work together. An oil pump supplies oil to the gear sets, clutch and integrated differential; thermal management is handled by an oil-to-water and an oil-to-air heat exchanger. In Lamborghini’s new dual-clutch transmission, engine power flows along a twin drive shaft and two output shafts. Two multi-plate clutches positioned one behind the other operate two mutually independent partial gearboxes. Clutch K1 sends the torque via a solid shaft to the gear sets for gears 1, 3, 5 and 7. Rotating around the solid shaft is a hollow shaft. It is connected to 14 clutch K2 and drives the gear sets for gears 2, 4 and 6, as well as reverse gear. The two partial gearboxes are permanently active, but only one of them is connected to the engine. When, for example, the driver is accelerating in third gear, the second partial gearbox already has the fourth gear engaged in preparation. The gearshift takes place through switching the clutches – K1 opens and K2 closes in just a few hundredths of a second. The driver can shift gears himself via the steering wheel paddles, or make use of the fully automatic drive program. When maximum acceleration is required, a touch of a button hands the business of engaging the clutch at optimum engine speed over to Launch Control. It makes sure that the engine power is delivered to the road with a perfectly regulated degree of tire slip. One classic Lamborghini strength is all-wheel drive – for more than 20 years, it has stood for the ultimate in dynamics, traction and stability. Back in 1993, the Diablo VT was the first Italian super sports car with four driven wheels. In the Huracán LP 610-4, too, superior traction means that drivers can accelerate out of corners earlier than those in rear-wheel drive competitors – with a brand new all-wheel drive system developed from the ground up strictly for maximum performance. At the second output shaft, the LDF transmission incorporates a connection with the prop shaft that runs through the V10 crankcase to the front axle. There, an electronically controlled and hydraulically actuated multi-plate clutch handles the matter of torque distribution – marking a further step forward compared with the viscous coupling of the Lamborghini Gallardo. Inside is a set of plates running in an oil bath. The metal friction rings are arranged axially in pairs – one ring in each pair is permanently interlocked with the casing that rotates with the prop shaft, the other with the short output shaft leading to the front axle differential. Under normal driving condition, the multi-plate clutch diverts only around 30 percent of the engine torque to the front wheels – meaning the Huracán has a strong rear-drive bias. However, should traction at the rear axle diminish, the clutch can smoothly and in a matter of seconds divert up to 50 percent of torque to the front wheels by pushing the plate set together in a controlled manner. However, a maximum of 100 percent of the torque can be distributed to the rear axle. At the rear axle, a mechanical differential lock integrated into the LDF transmission improves traction even further. Each and every kilometer in the Huracán LP 610-4 is pure fascination, particularly on a race track or winding country road. The super sports car from Sant’Agata Bolognese is a driving machine with extremely high cornering speeds and precise, virtually instantaneous reflexes. It is consistently effortless to drive, stable and free of unpleasant surprises. Like in a race car, the mid-engine concept provides an ideal distribution of axle load of around 42:58, and the Huracán’s chassis, too, makes use of motorsport technologies. The double wishbone suspension at all four corners, for example, is made from forged aluminum in order to reduce unsprung masses. Rubber/metal mounts direct the transverse forces precisely into the bodyshell, while their elasticity delivers good longitudinal running characteristics. Track measures 1,668 mm at the front and 1,620 mm at the rear. 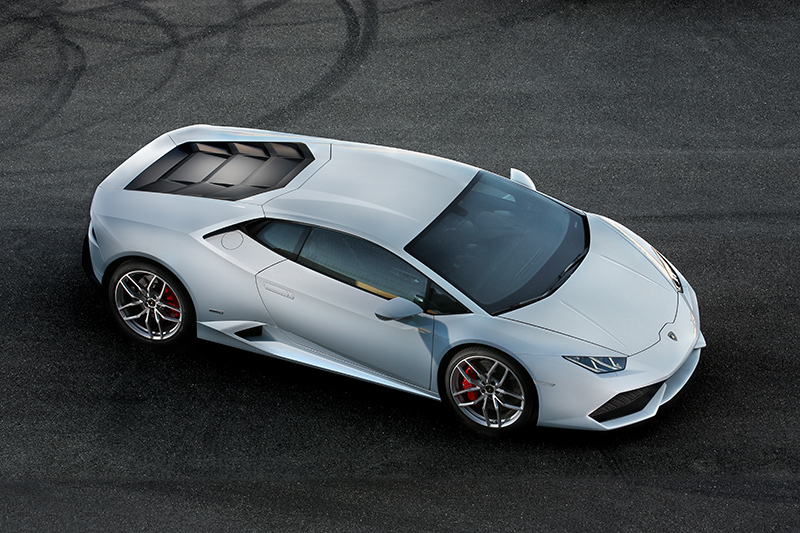 New developments in the Lamborghini Huracán LP 610-4 include the electromechanical rack-and-pinion power steering. It delivers finely differentiated, immediate feedback and has a direct, sporty ratio of 16.2:1. Its power assistance, which generally consumes very little energy, decreases as speed increases. The electromechanical power steering helps the driver when braking and countersteering on road surfaces that are slippery on one side by supporting the right correction. Lamborghini Dynamic Steering (LDS) is available as an option and marks a further innovation in the super sports car segment. At its heart is a superimposed drive unit in the steering column driven by an electric motor. The so-called strain wave gear can vary the ratio by almost 100 percent (9:1 – 17:1). In city traffic, the LDS steering is extremely direct, while its intentionally indirect setup at high speed delivers supreme directional stability. At the very edge of the cornering envelope, it minimizes understeer, as well as oversteer during load transfer, by delivering tiny, targeted countersteering impulses. Also offered as an option is the new magneto-rheological damper control system. Circulating in the pistons of the shock absorbers is synthetic oil containing tiny magnetic particles. When a voltage is applied to a coil, it generates a magnetic field. Inside this, the particles align themselves perpendicularly to the flow of electricity and thus restrict the flow of oil through the piston channels. A high-speed control unit continually calculates the optimum value for each wheel. During turn-in, for instance, it raises the damping force at the outside front wheel. This has the effect of reducing bodyroll, and reaction becomes even more spontaneous as a result. Another innovation in the Lamborghini Huracán is a new dynamic drive mode system. The system is called ANIMA (Italian for Soul) – “Adaptive Network Intelligent Management “. Via a button in the lower steering wheel spoke, the driver can switch a number of different vehicle systems between the modes “Strada”, “Sport” and “Corsa” – from an everyday setup, through sporty to racing. It encompasses the throttle valves, the sound flaps in the exhaust, the LDF 7- speed dual-clutch transmission, the all-wheel drive, the ESC stability control and the LDS as well as the magneto-rheological dampers. The Lamborghini Huracán LP 610-4 runs in its standard format on silver 20- inch alloy wheels; their “Giano” design is inspired by the classic 17 Lamborghini trademark of five large holes. The tires – 245/30 at the front and 305/30 at the rear – are from the Pirelli P Zero range and were developed specifically for the Huracán. Even lighter are the optional “Mimas” wheels featuring a twin-spoke design and also measuring 20 inches – they are made using flow-forming technology. Behind the big wheels are potent brakes come as standard with carbonceramic technology. All four discs are internally ventilated and perforated, their cooling channels quickly dissipating the heat. The front discs measure 380 millimeters, the rear 356 millimeters. Ten elements fasten the friction ring to an aluminum carrier, which forms the connection to the wheel hub – a concept from motorsport. The high-end discs are virtually fade-free, extremely robust and offer exceptional performance paired with excellent longevity; together, they weigh considerably less than equivalent steel brake discs – the number of kilograms measuring in double figures. The calipers – with six pistons at the front and four at the back – are painted silver and bear Lamborghini lettering. They are also optionally available in yellow, black, red and orange. Furthermore, the Huracán is equipped with an electric parking brake. The Lamborghini Huracán LP 610-4 uses a brand new electronics platform. One particular focal point of the development process was the integration of the ESC electronic stability control, which receives and sends all data at incredibly high speeds. In the dynamic system’s “Sport” and “Corsa” modes, ESC provides an increase in lateral dynamics. For a fast lap on the track, the driver can completely deactivate the system. The Lamborghini Piattaforma Inerziale is a system for precise and direct measurements of the vehicle movements (X, Y, Z accelerations, Roll, Pitch, Yaw rates). It consists of several on-board sensors: 3 accelerometers + 3 gyroscopes precisely placed on the center of gravity of the car and provides real-time high-speed communication via a FlexRay CAN-bus to ESC, 4WD, LMR, LDS. The result are fast and responsive vehicle dynamics as well as maximized vehicle performances. The system is derived from aeronautics and for the first time applied in a series production car. The new super sports car from Sant’Agata Bolognese leaves the factory with an exceptionally high level of standard equipment. It encompasses a host of high-end technologies including the Iniezione Diretta Stratificata dual injection, the stop & start system, the 7-speed dual-clutch transmission Lamborghini Doppia Frizione and the all-wheel drive with the new electrohydraulic multi-plate clutch. In the carbon-ceramic brake discs and the new ANIMA dynamic drive mode system the Huracán offers two more first-class features. All light functions are fulfilled by LEDs – from the LED headlamps to the interior lighting. The seats are equipped with electric backrest adjustment, while the electric exterior mirrors have a fold-in function. Automatic climate control is also standard, as is tinted glass all around. Two front airbags and head/thorax airbags protect the driver and co-driver in the event of an accident, with belt tensioners completing the package. Further standard equipment features in the Lamborghini Huracán LP 610-4 are the versatile multi-function steering wheel, the shift paddles for the LDF transmission and the 12.3-inch display, which presents all key instruments in a range of virtual views. The Lamborghini Infotainment System is also standard and includes a radio with CD/DVD drive, an audio interface and six speakers. The interior of the super sports car comes as standard in Nero Ade black with soft leather and Alcantara. Customers can also choose from a number of additional variants – the two-tone “Elegante” interior, the one and twotone “Sportivo” interior and the two-tone “Sportivo” interior with nappa 19 leather. Following market launch, Lamborghini will expand the Ad Personam program – alongside exclusive colors and yarns, it offers a host of additional features for making the car as individual as its owner’s fingerprints. The equipment list for the Huracán includes further comfort options: an optical parking assistant front and rear – which can be enhanced with a reversing camera – fully electrically adjustable heated seats and an armrest. In the field of infotainment, Lamborghini offers a navigation system with extremely detailed 3D graphics, a Bluetooth interface and a digital radio tuner. For the exterior, there is a transparent engine cover together with engine bay cladding in carbon fiber. Optional wheels in Mimas design also set powerful accents. The LDS steering system with its variable ratio and MagneRide electromagnetic damping make the already extremely dynamic handling just that little bit more thrilling. The tire pressure warning display rounds off the range of chassis options. The predecessor to the Huracán can already be considered a legend. With a total of 14,022 built from 2003 until 2013, the Gallardo was an icon of Italian automotive design and engineering. For the company, it achieved previously unheard-of sales volumes; and thanks to a careful program of updates, it continued to sell very well up to the very last minute. The original version of the Gallardo debuted as a coupe eleven years ago at the Geneva Motor Show – its 5.0-liter V10 delivering 368 kW / 500 hp. A six-speed manual gearbox – optionally available as the automated e.gear version – directed the torque to a rear-biased all-wheel drive with a viscous coupling. It was followed in 2005 by the Gallardo Spyder with 382 kW / 520 20 hp. The lightweight Gallardo Superleggera coupe with 390 kW / 530 hp marked the final iteration of the five-liter engine. With the 2008 facelift, Lamborghini re-engineered the engine and the model designation. The Gallardo Coupe was now called the LP 560-4, in reference to the power output (412 kW) delivered by its ten-cylinder engine, refined by direct injection and with its displacement increased to 5.2 liters. The Spyder LP 560-4 followed a year later. 2010 saw the arrival of the LP 570-4 Superleggera, with yet more output (419 kW); followed by the LP 570-4 Spyder Performante. For fans of rear-wheel drive, Lamborghini brought out the Gallardo LP 550-2 in 2011 as a coupe and spyder. Finally, in 2012, the LP 560-4 received another facelift that concentrated on the design. Over the ten years of its production life, Lamborghini kept the Gallardo fresh with a host of special-edition models. These included – to name but a few – the SE (2005), the LP 550-2 Valentino Balboni (2009), the LP 570-4 Super Troefo Stradale (2011), the LP 570-4 Edizione Tecnica (2012), the LP 570-4 Squadra Corse (2013) and the Gallardo 50th anniversary in celebration of the 50th anniversary of Lamborghini Automobili in 2013. In 2004 and again in 2008, the Italian police took delivery of a pair of very special Gallardos. The super sports car from Sant’Agata also demonstrated its dynamic potential on the race track with impressive results. Since 2005, the Gallardo has been registered to compete in the GT class, and from 2006, it took part in the German VLN Endurance Championship. Both competitions saw it achieve a great deal of success. Then the world’s fastest single-brand series celebrated its debut in 2009 – from the very start, the Lamborghini Blancpain Super Trofeo established itself as a hugely popular racing series. Content and images provided by: Automobili Lamborghini S.p.A.